Though humans no longer make use of hair for protection, heat retention, or camouflage, it still remains a very important means by which individuals display and are recognized. Appropriate appearance and grooming are still very important in social organization and the human relationships. The human body contains approximately five million hair follicles while the scalp (prior to any kind of hair loss) contains 100,000-150,000 hair follicles. Blondes have the greatest number of scalp follicles, followed by brunettes. Humans with red hair have the fewest number of scalp follicles. The normal growth rate of scalp hair is one-fourth to one-half inch per month. It is important to understand the normal hair growth cycle to understand why hair loss occurs. The hair follicle is an anatomical structure which evolved to produce and extrude (push out) a hair shaft. Hair is made up of proteins called keratins. Human hair grows in a continuous cyclic pattern of growth and rest known as the "hair growth cycle." 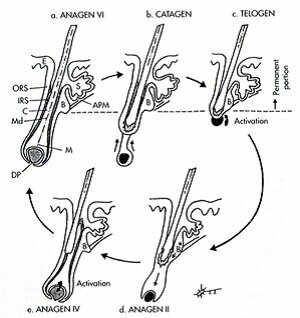 Three phases of the cycle exist: Anagen= growth phase; Catagen= degradation phase; Telogen= resting phase. Periods of growth (anagen) between two and eight years are followed by a brief period, two to four weeks, in which the follicle is almost totally degraded (catagen). The resting phase (telogen) then begins and lasts two to four months. Shedding of the hair occurs only after the next growth cycle (anagen) begins and a new hair shaft begins to emerge. On average 50-100 telogen hairs are shed every day. This is normal hair loss and accounts for the hair loss seen every day in the shower and with hair combing. These hairs will regrow. Not more than 15% of the follicles are in the resting phase (telogen) at any time. A variety of factors can affect the hair growth cycle and cause temporary or permanent hair loss (alopecia) including medication, radiation, chemotherapy, exposure to chemicals, hormonal and nutritional factors, thyroid disease, generalized or local skin disease, and stress. "Andro" refers to the androgens (testosterone, dihydrotestosterone) necessary to produce male-pattern hair loss (MPHL). "Genetic" refers to the inherited gene necessary for MPHL to occur. In men who develop MPHL the hair loss may begin any time after puberty when blood levels of androgens rise. The first change is usually recession in the temporal areas, which is seen in 96 percent of mature Caucasian males, including those men not destined to progress to further hair loss.. Although the density of hair in a given pattern of loss tends to diminish with age, there is no way to predict what pattern of hair loss a young man with early MPHL will eventually assume. In general, those who begin losing hair in the second decade are those in whom the hair loss will be the most severe. In some men, initial male-pattern hair loss may be delayed until the late third to fourth decade. It is generally recognized that men in their 20’s have a 20 percent incidence of MPHL, in their 30’s a 30 percent incidence of MPHL, in their 40’s a 40 percent incidence of MPLH, etc. Using these numbers one can see that a male in his 90’s has a 90 percent chance of having some degree of MPHL. Androgens (testosterone, dihydrotestosterone) are necessary for the development of MPHL. The amount of androgens present does not need to be greater than normal for MPHL to occur. If androgens are present in normal amounts and the gene for hair loss is present, male pattern hair loss will occur. Axillary (under arm) and pubic hair are dependent on testosterone for growth. Beard growth and male pattern hair loss are dependent on dihydrotestosterone (DHT). Testosterone is converted to DHT by the enzyme, 5¤ -reductase. Finasteride (Propecia®) acts by blocking this enzyme and decreasing the amount of DHT. Receptors exist on cells that bind androgens. These receptors have the greatest affinity for DHT followed by testosterone, estrogen, and progesterone. After binding to the receptor, DHT goes into the cell and interacts with the nucleus of the cell altering the production of protein by the DNA in the nucleus of the cell. Ultimately growth of the hair follicle ceases. The hair growth cycle is affected in that the percentage of hairs in the growth phase (anagen) and the duration of the growth phase diminish resulting in shorter hairs. More hairs are in the resting state (telogen) and these hairs are much more subject to loss with the daily trauma of combing and washing. The hair shafts in MPHL become progressively miniaturized, smaller in diameter and length, with time. In men with MPHL all the hairs in an affected area may eventually (but not necessarily) become involved in the process and may with time cover the region with fine (vellus) hair. Pigment (color) production is also terminated with miniaturization so the fine hair becomes lighter in color. The lighter color, miniaturized hairs cause the area to first appear thin. Involved areas in men can completely lose all follicles over time. MPHL is an inherited condition and the gene can be inherited from either the mother or father’s side. Female hair loss occurs in more than one pattern. And is not as easily recognizable. Unlike hair loss in men, female scalp hair loss may commonly begin at any age through 50 or later, may not have any obvious hereditary association, and may not occur in a recognizable "female-pattern alopecia" of diffuse thinning over the top of the scalp. Diagnosis of hair loss in a woman should be made by a trained and experienced physician. Triangular alopecia—loss of hair in the temporal areas that sometimes begins in childhood. Hair loss may be complete, or a few fine, thin-diameter hairs may remain. The cause of triangular alopecia is not known, but the condition can be treated surgically. Telogen effluvium—a common type of hair loss caused when a large percentage of scalp hairs are shifted into "shedding" phase. The causes of telogen effluvium may be hormonal, nutritional, drug-associated,after pregnancy or stress-associated.